Instant downloads of all 946 LitChart PDFs (including Catching Fire). Katniss has a conflicted relationship with her mother. Following her father’s death, her mother fell into deep depression and now rarely speaks. As a result, Katniss has a difficult time feeling love and affection for her mother, even as she recognizes that her mother is a kind and intelligent woman. During the course of the novel, Katniss comes to recognize the extent of her mother’s compassion—her mother is a skilled nurse and healer, without whom the people of District 12 would suffer greatly. ). Note: all page numbers and citation info for the quotes below refer to the Scholastic Press edition of Catching Fire published in 2013. My time in the arena made me realize how I needed to stop punishing [my mother] for something she couldn’t help, specifically the crushing depression she fell into after my father’s death. Because sometimes things happen to people and they’re not equipped to deal with them. Unlock explanations and citation info for this and every other Catching Fire quote. My mother has to save the strongest for the worst pain, but what is the worst pain? To me, it’s always the pain that is present. If I were in charge, those painkillers would be gone in a day because I have so little ability to watch suffering. My mother tries to save them for those who are actually in the process of dying, to ease them out of the world. 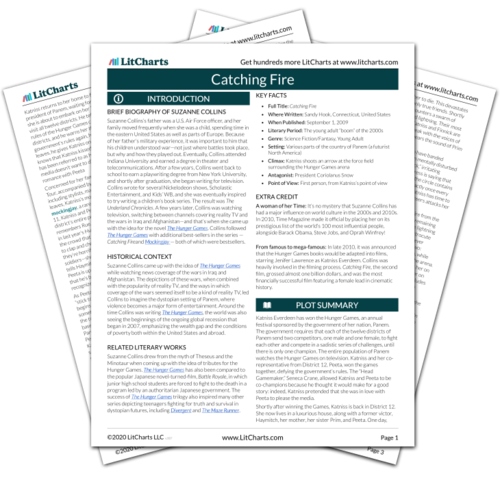 Get the entire Catching Fire LitChart as a printable PDF. The timeline below shows where the character Katniss’s mother appears in Catching Fire. The colored dots and icons indicate which themes are associated with that appearance. Arn, Jackson. "Catching Fire Characters: Katniss’s mother." LitCharts. LitCharts LLC, 4 Nov 2015. Web. 24 Apr 2019. Arn, Jackson. "Catching Fire Characters: Katniss’s mother." LitCharts LLC, November 4, 2015. Retrieved April 24, 2019. https://www.litcharts.com/lit/catching-fire/characters/katniss-s-mother.